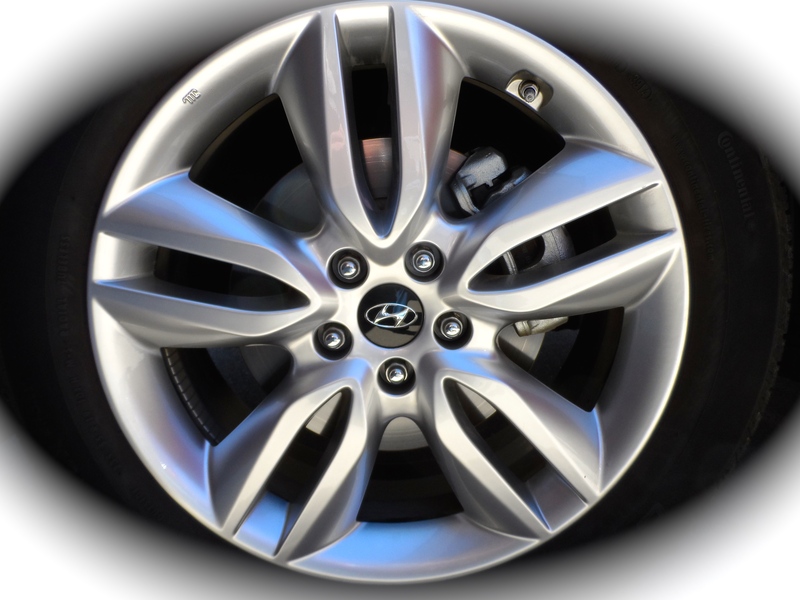 Hyundai Motor Group is one of the five biggest automobile manufacturers in the world, and part of the firm is KIA, a popular line of automobiles. Hyundai is the main nameplate, and one which was on the Santa Fe Sport 2.0T crossover that I recently tested. It was loaned to me courtesy of STI-Drive in Denver. The Santa Fe is, as you might expect, named after the beautiful New Mexico city 450 miles south of my home of Greeley, Colorado. 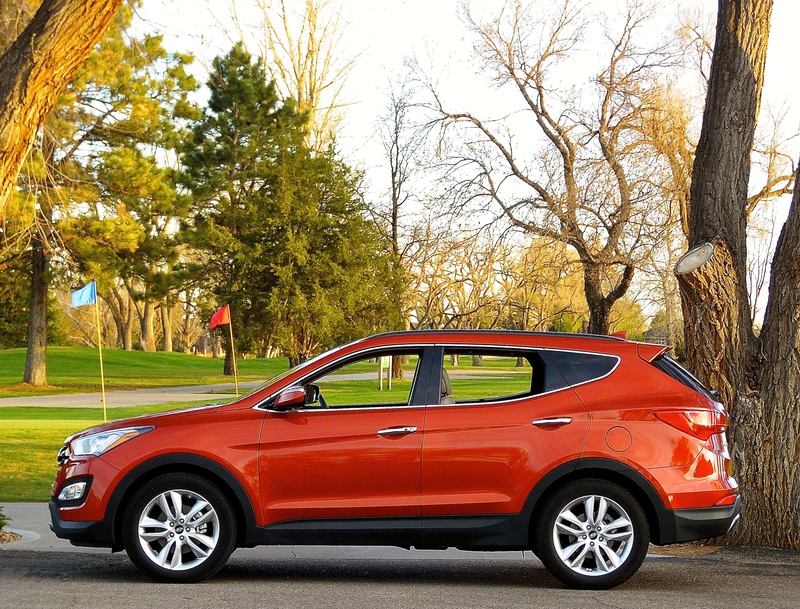 The Santa Fe is based on the Hyundai Sonata sedan platform, and is classified as a mid-size crossover. It is currently in its third generation form, and has been produced since 2000. The one I tested was painted Canyon Copper metallic and inside it was upholstered in perforated beige leather seating for five. Its M.S.R.P. totaled $38,350.00, and that included $875.00 for freight and $4,350.00 for the properly-named “ultimate” package. Included in that last package were HID headlamps, LED taillights, panoramic moon roof, navigation system with 8″ touchscreen, 12-speaker Infinity stereo, heated seating front and rear, air conditioned front buckets, heated steering wheel and rear parking assist sensors. Standard features of the Sport 2.0T included rear window sunshades, XM radio/CD disc player, power locks/windows/mirrors, pushbutton starter, blind spot monitor and power rear lift gate. Power for the Santa Fe comes from a 2 liter, 4 cylinder turbocharged engine with 264 horsepower coupled with a 6-speed Shiftronic automatic transmission. Acceleration was brisk, and is reportedly zero to 60 in 6.6 seconds. EPA fuel economy ratings for the Sport come in at 18-city, 24-highway, 21-combined miles per gallon. The tank holds 18.8 gallons, and that is a benefit. A compliant ride provided comfort for my wife and I when we travelled to Cheyenne to conduct some business. The car handled wind (it had to up there) well, and wind noise inside is acceptable. For about town driving and a little off road usage, both hillstart assist control and downhill brake control are on hand to make things a little more manageable. The attractive interior had two rows of seating (front buckets), and there is 35.4 cubic feet of cargo space behind the second row. If that row is folded down, the numbers moves up to 71.5 cubic feet. The second row seat is a 40/20/40 folding affair. The heated and air conditioned front buckets were supportive and comfortable (and attractive). The all-wheel drive car is 193.1″ long, rests on a 110.2″ wheelbase, and has 146 cubic feet of passenger volume inside. Styling, a hallmark of the Santa Fe, picked up some glances (and stares) during the week driving the Santa Fe, and I particularly liked the color. Chrome handles were on the doors, Ten-spoke 19″ alloys were mounted on the axles, and the tires were P225/55R19 Continental CrossContact LX sport all season radials. 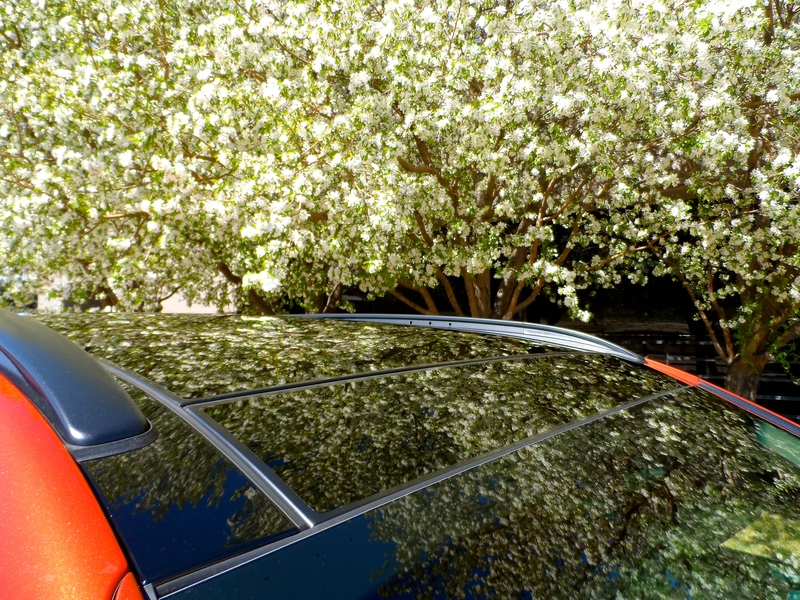 The Hyundai was a pleasure to test, and in my mind it represents a good value with its sub-$40,000.00 window sticker. Jeep has produced its Patriot since the introduction of the compact crossover SUV nine years ago this spring at the New York Auto Show. It, along with the Jeep Compass, is manufactured on what is called the MK platform. The Compass is designed to appeal to female motorists with the Patriot as a designated favorite of males. 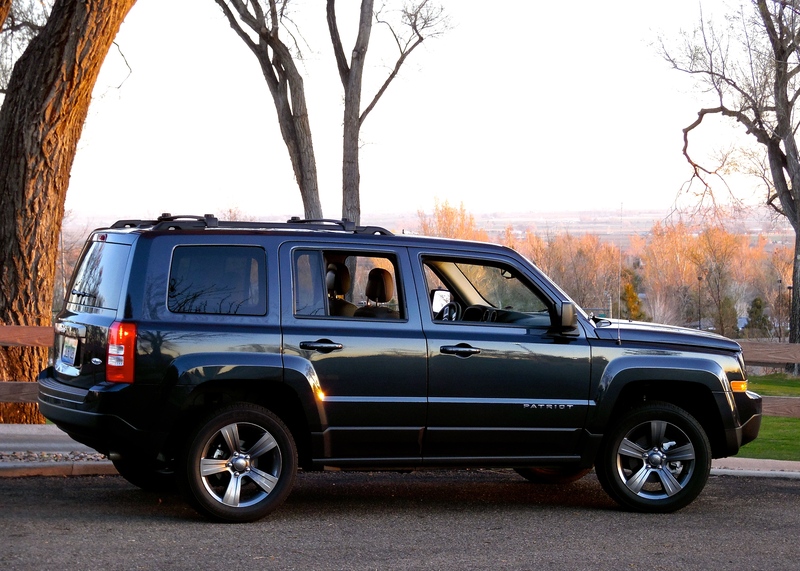 The Patriot, in its Latitude model offering, is the subject of this week’s review, one which was loaned to me by Rocky Mountain Redline in Dacono, CO.
My Patriot test car (crossover?) was painted Granite Crystal metallic with Light Pebble beige leather interior. The Latitude is stationed at the middle of the Patriot lineup, with a Limited model available for additional cost. The Latitude carries a base price of $24,395.00, and freight adds $995.00 to that figure. 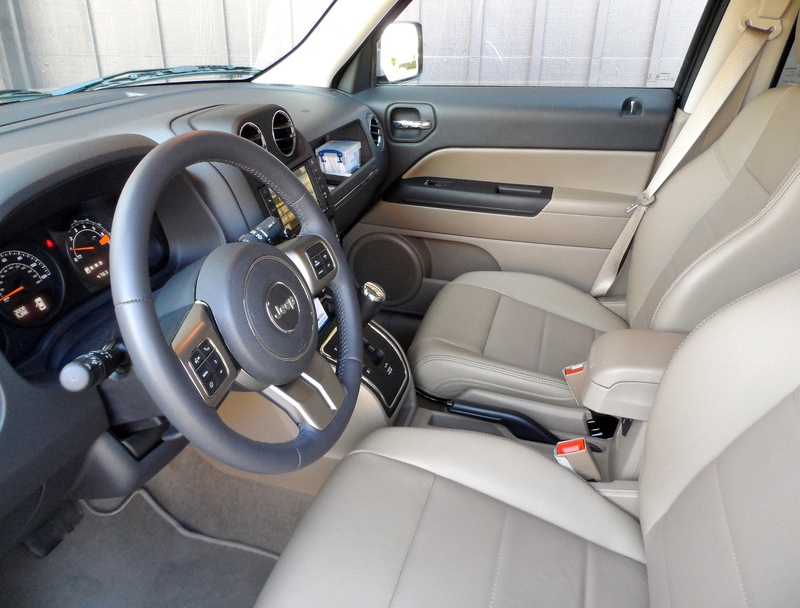 My Patriot had as options a preferred package (moon roof, power leather seating, etc.) for $1,095.00, a security package (security system, tonneau cover, etc.) for 695.00, a navigation package for $1,385.00, and a U-Connect/XM radio/Bluetooth technology package for $495.00. Total M.S.R.P., therefore, was $29,060.00. Styling of the Latitude has been around for nearly a decade, but has aged well and looks good. “Patriot” and “High Altitude” badging on the car as well as the functional luggage rack gave it a “Jeep” look, as did the giant round headlamps. Firestone P215/60R 17 Touring mud and snow tires were mounted on five-spoke gunmetal gray alloy wheels. Inside, comfortable leather buckets and a bench back seat provide five passenger seating, and a tonneau cover can conceal guns or golf clubs in the 23 cubic foot luggage compartment (which expands to 53.5 when the second-row seating is folded flat). 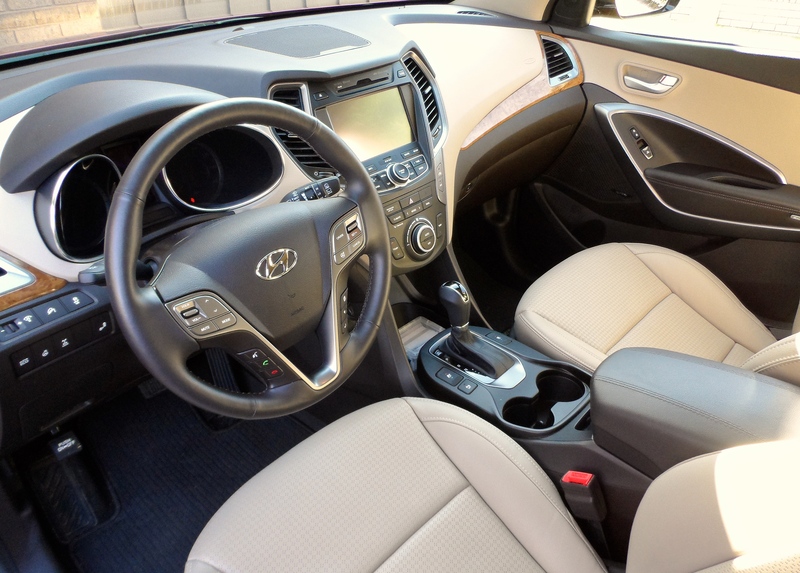 Features included Bluetooth, air conditioning, power windows, liftgate speakers, keyless entry, remote start, a touch-screen audio system, the navigation, Uconnect Web with a Wi-Fi hot spot, satellite radio and a USB port. A lever-type hand brake is on hand, and the shift tower is mounted neither on the console, nor on the dashboard; kind of in-between, like a Prius. It worked fine with its duties to shift the six-speed automatic transmission, and an additional benefit of the interior is the space for odds and ends above the glove box in front of the passenger seat. I liked it for my stuff while making rounds in the Patriot for a week. A Jeep is the one brand of vehicle that I can name when entering blindfolded – that being a result of the husky, bold steering wheel grip. The Latitude engine was a 2.4 liter, four cylinder with 172 horsepower (@ 6,000 rpm) and 165 lb. ft. of torque (@ 4,400 rpm). EPA fuel economy is rated at 21 city-mpg, 27 highway-mpg, and 23 combined-mpg. My observance was of 23.8 mpg for the week of driving the Latitude. The fuel tank holds 13.5 gallons of regular unleaded gasoline. Ruth, my wife, made mention of the visibility of the Patriot, which was good. Driving the Jeep is pleasurable, with ride, guidance, and interior noise within tolerances. It’s not a hot rod, but with 9.1″ of ground clearance and four-wheel drive, highway driving is not its forte. All around utility is, and in that department I think the Jeep gets the job done, and for under $30,000.00, no less.